128-page hardcover book by Lucy Willis. Perhaps not for beginners, this book has beautiful images and lots of useful information for any painter. The paintings are inspirational and excellent examples of what she is talking about. Lucy Willis gives expert advice on how to master tone, hue and shadow to create atmospheric paintings. 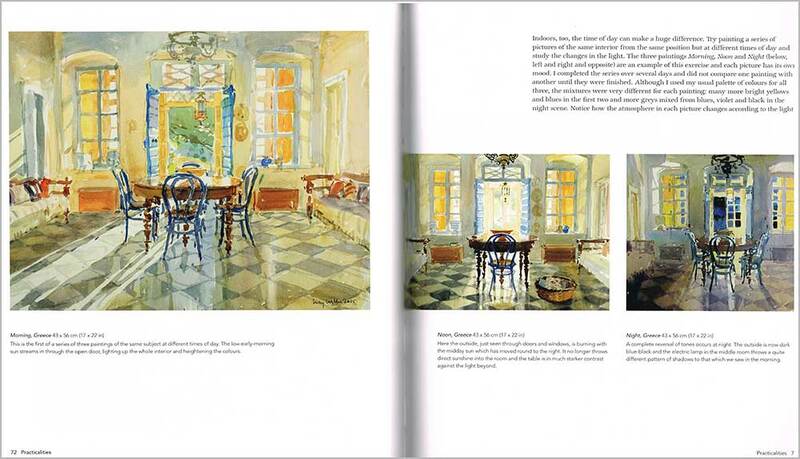 The book features several step-by-step demonstrations throughout to help painters of all levels develop their skills. 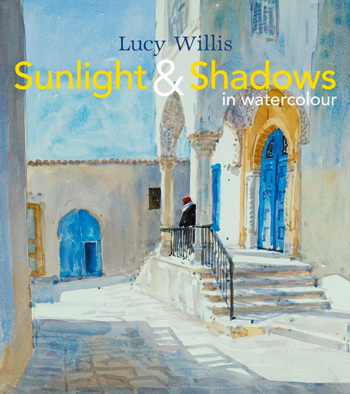 Lucy encourages watercolour painters to explore the effect of natural light and shade in various themes and settings, including landscapes, gardens, interiors, still life and portraits. 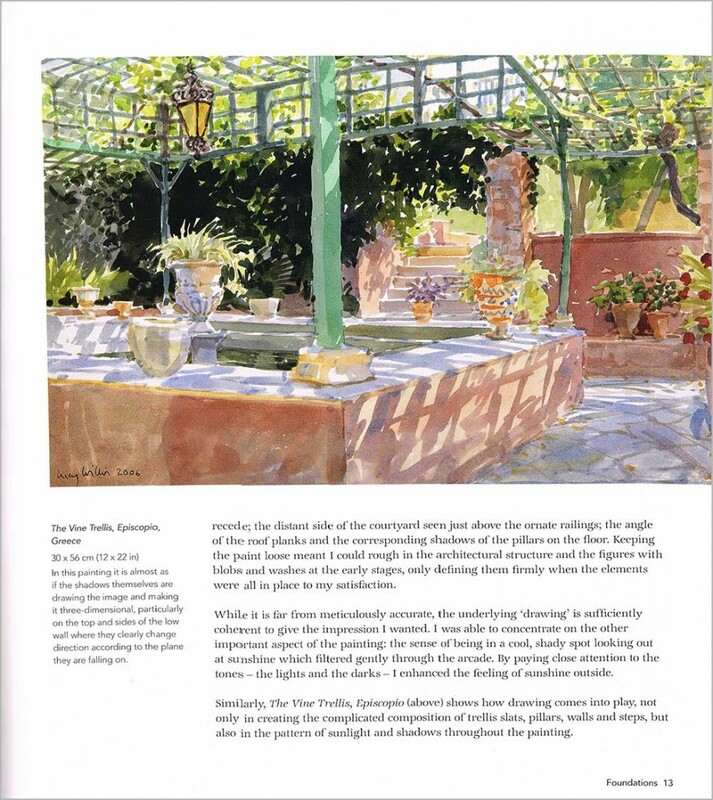 She gives the reader useful advice on how to paint cast shadows, curved shadows, soft- and hard-edged shadows and shadows in perspective. She also talks about the effects light has on objects and landscapes. There is a lot to learn from a very knowledgeable painter. Lucy Willis RWA is a full time professional artist living in Bridgwater, Somerset. She trained at the Ruskin School of Drawing and Fine Art, Oxford where she received a rigorous academic training which included drawing from life and studies of anatomy. She then set up her own workshop in Greece teaching etching and drawing to students attending the Aegean School of Fine Art. 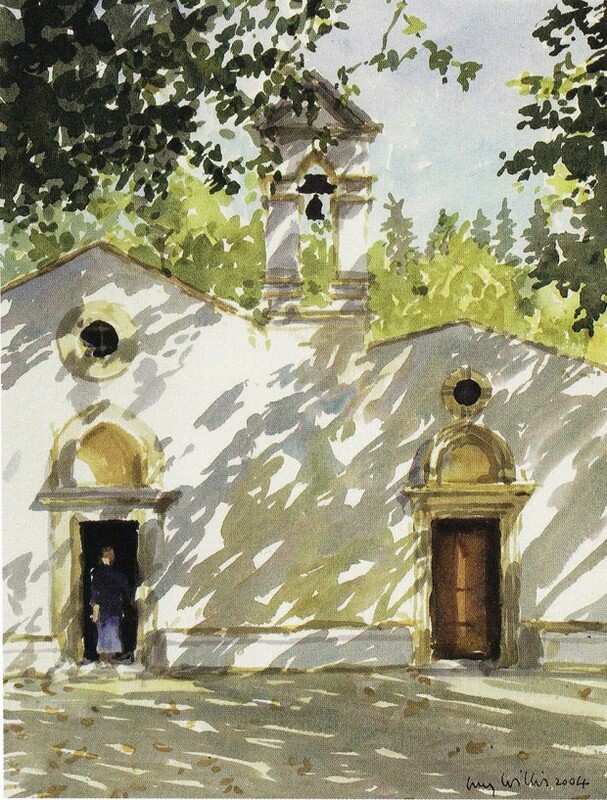 In 1981 she won a Bockingford International Watercolour Award and travelled to paint in Italy. Much of her work is inspired by her travels to India, Africa and Greece. She won the BP Portrait Award at the National Portrait Gallery in 1992 for her portrait of prison inmates, ‘At Her Majesty’s Pleasure’, and was Artist in Residence at Shepton Mallet Prison in Somerset until 1993. Sunday Times Watercolour Competition judge, and acclaimed watercolour artist, Lucy Willis exhibits regularly in London and at her studio. She has had many solo exhibitions including ten solo exhibitions at the Chris Beetles Gallery in London. She is renowned for her ability to capture light and atmosphere, as portrayed in her books Light in Watercolour and Travels in Watercolour. Click on the underlined link to go to the current offer on the book Sunlight & Shadows in Watercolour on the Jackson’s Art Supplies website. Watercolour by Lucy Willis, from the book Sunlight & Shadows in Watercolour. It’s good to see a water colour book ‘not for beginners. There are thousands of books for newbies, but very few on the finer points of wc painting. Shadows and light are vital parts of painting, glad there is now a full book on the subject. Hi Doug. Yes, I agree, there are lots of books for beginners and books that don’t go over the same ground are always welcome.